Spring is (not yet) sprung! What’s flowering in early March? Hazy lavender, silvery foliage, aromatic herbs – these are the first plants to spring to mind when I think about a Mediterranean garden. But it’s not just the right selection of plants that will conjure up that holiday feeling. It’s the whole caboodle – the laid-back, make the most of the outdoor space, relaxed ambience of a week in Provence – I want to recreate! Sometimes we don’t know what we want until we see it in someone else’s garden! In all these internet searches every month, what gardeners are looking for is a little inspiration. Pinterest is great for sharing ideas. Try scrolling through some images to see which ones you instinctively fall in love with and start collecting your favourite pictures on your own board. For thousands of gardening ideas, click here to follow the Weatherstaff PlantingPlanner on Pinterest. Even with a glorious mood board of beautiful images to inspire, though, it’s not always easy to transfer these ideas to our own garden borders. Here are some ideas for creating the garden of your dreams. When is a triangle not a triangle? Our main garden is an elongated, right-angled triangle, bordered by a wild hedge edging a country lane. When we first moved in, the entire garden was laid to lawn and could be viewed in all its triangular, tapering glory! Pythagoras might have been delighted with the opportunity to experiment with the properties of our triangle. We were more perplexed by the dilemma of how to make a triangle look more like a rectangle! In our vast expanse of grassness, we were also keen to add interest by creating pathways and hidden areas, as well as planting up flower borders to soften the boundaries. Winter is not all bare branches and empty garden borders! Camera in hand, I set myself the challenge of tracking down plants which brighten up the dead days of winter. 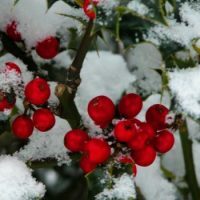 Even when frosted with ice or with a sprinkling of snow, holly can be relied on to provide deep greens and rich red berries. Ivy and mistletoe complete the trio of festive evergreens. In the medieval, walled town of Pérouges, in eastern France, I spotted a collection of window boxes which combined Christmas baubles and pine cones with winter pansies and cyclamen. When it’s time to take down the Christmas decorations, the pansies and cyclamen continue to brighten up the window sills. There are some things the French seem to do effortlessly. Crème de cassis and white wine. Raspberry tarts. Shabby chic. The careless and uncontrived juxtaposition of faded elegance and modern buildings. And what is it about the French and flowers? Their streets are a blaze of carefully designed colour and a visit to a public park feels like an outing to the botanical gardens. Grasses and sedges add movement and airiness to the designs. In a park near the railway station, fluffy lagurus ovatus contrasts with statuesque canna leaves. The pretty, delicate Gaura lindheimeri adds a light touch to many of the flowerbeds. I want to whip out my camera and analyse the plant combinations. If you love charm over elegance, profusion over minimalism, natural haphazardness over control and order, the chances are that you love the cottage garden style. Traditional cottage garden favourites are daisy-style flowers, such as asters, fleabane daisies, coreopsis and echinacea. 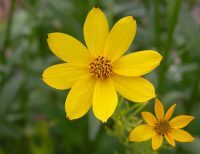 Coreopsis verticillata ‘Grandiflora’ has cheery yellow, starry flowerheads, carried in abundance on wiry stems in summer. Asters come in shades of white, pink, purple and blue. I love Aster pyrenaeus ‘Lutetia’, for its starry flowerheads in palest lilac, with yellow centres. It has a long flowering season from mid-summer to mid-autumn and is completely resistant to powdery mildew – a disease which plagues many asters. 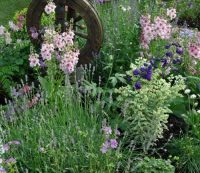 Planting will be exuberant, with self-seeding annuals and low-maintenance perennials packed in together and spilling over border edges. Climbers scramble over fences, garden gates and trees. Historically, gardens for pleasure were the preserve of the wealthy. Cottage gardens were for the poorer levels of society and were purely functional. The first cottage gardens met the needs of early tenant farmers, by providing the vegetables, herbs and fruit which formed the mainstay of their diet. 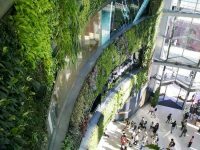 I’ve visited lots of gardens, but The Water Garden at Emquartier – slap bang in the middle of a luxury shopping mall and five storeys above the city streets – was a new experience for me. EmQuartier is Bangkok’s brand new shopping mall, next to Phrom Phong BTS station and just across Sukhumvit Road from the well-established (and recently renovated) Emporium mall. Alongside the modern glass and chrome architecture, there’s been a real effort to create breathing green spaces on every level. 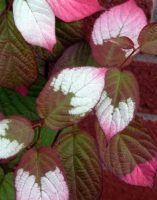 You know the scenario – you’re wandering around the garden centre, a horticultural show, a friend’s garden, and there’s this gorgeous little plant you desperately need to own. So you buy it (or dig up a clump if offered or take a few seeds). Your own garden is bursting at the seams. 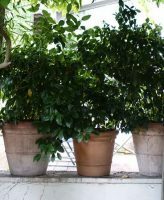 There is no room for a single extra plant, but how many gardeners are staunch minimalists who will stoically turn their backs on that enticing little plant?